I made up a recipe this morning. At the Orleans farmer’s market yesterday I bought a pint of wild blackberries. Another customer asked the man (from Terra Luna) where he got them and he responded with a general region and sneaky smile. “I can’t give you specifics,” he said. I love berries. I wanted to introduce these to something else I love: crepes. My crepe love started in college when Rachel and I would go to Arrow Street Crepes in Harvard Square (today’s version is a far cry from the tiny, 8-seat hole in the wall we used to dine at), and I would get a crepe stuffed with fruit and Nutella and talk about life with my best friend. Thus began my love affair. It turns out crepes are not difficult to make. You don’t need a special pan or a fancy mixer – you just need to make sure the batter is the right consistency to be able to distribute it evenly across the bottom of a regular skillet (a very large, round skillet is best). I have tried several recipes, and settled on this version which is a mix of a few of them. I’ll add a squeeze of lemon juice if I have it. You just whisk it all in a bowl until smooth and voila! crepe batter. I’ll leave the crepe making technique beyond this to the experts. A google search turns up all kinds of advice including videos on how to best get your crepe nice and thin. So, back to the blackberries. I started out making a compote, but then I realized that these sweet-tart guys have huge seeds (I spent half the time yesterday driving around mid-Cape picking them out of my teeth as I snacked on them). I put the pint in a small pot, sprinkled on some unsweetened dried coconut, and about a half cup of honey. 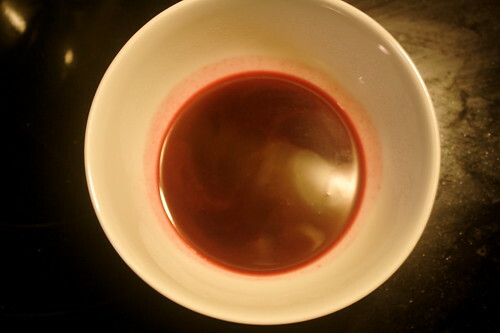 The mixture came to a boil, and I stirred and smooshed the berries to coerce the juices out. After about 10 minutes I removed the pot from the stove and let it cool. I cut a piece of cheesecloth and placed it in a small colander, dumped the berry mixture in, and used a spoon to press the juices through the sieve. The sauce was infused with coconut and retained the warm, sweet flavor of honey, and both of these balanced out the tart and tangy of the berries. Drizzled on top of crepes filled with a little yogurt and garnished with toasted nuts, it was a delicious breakfast. I don’t think I’ll turn into a frequent recipe writer, but to come upon an easy way to make an exciting and tasty accompaniment to breakfast without looking at a cookbook or the web was pretty cool. This is an article that was posted on Aug 23, 11:41 AM.